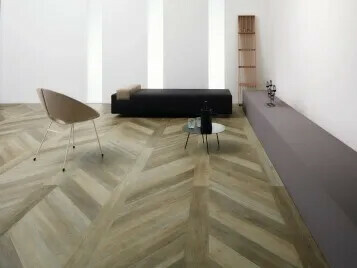 Forbo Flooring is a global manufacturer of high quality residential and commercial floor coverings. We can deliver 'total solutions' for every project, assuring quality and accountability from a single supplier. 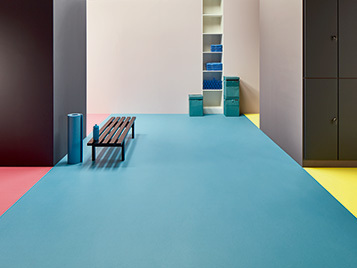 Marmoleum, Forbo's main linoleum brand, is a natural floor associated with sustainability, durability, high quality and innovative design. 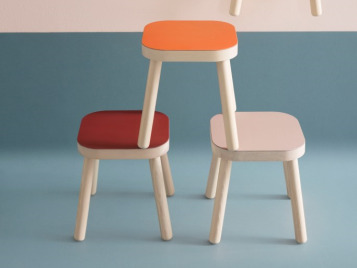 Our Marmoleum collection includes solutions for virtually any type of application. 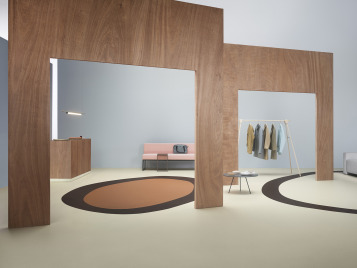 Discover the versatile world of Marmoleum with over 300 colours and more than 12 different structures to choose from, available in sheet and modular tile formats. Are you looking for the aesthetics of natural wood or stone floors with the advantages of strong, comfortable and durable vinyl? Our new Allura LVT collection is inspiring, offering over 100 different designs including our widest collection of woods. Vinyl floors are very popular because of their durability, low maintenance and versatility. Homogeneous vinyl is made of 1 single layer that offers vibrancy and depth of colour. It is incredibly durable and stain resistant which makes it a great flooring choice for heavy traffic areas. Forbo presents its new Sphera homogeneous flooring which is produced with the latest technology and offers striking floor designs. Heterogeneous vinyl is a multi-layer vinyl with a printed top layer providing endless design possibilities, lasting performance and low maintenance cost. 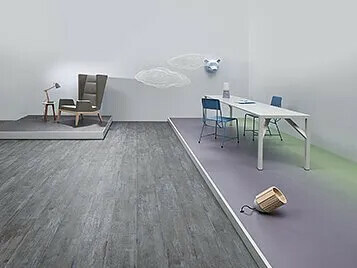 Our heterogeneous vinyl flooring is perfectly adapted for almost all application areas and we offer specialized flooring solutions like acoustic vinyl, slip resistant vinyl and loose lay vinyl. Go to the images below and explore our extensive range. Flotex is the only product available in the flooring market that combines the appeal of a textile floor covering with the practical and hygienic advantages of a resilient. Flotex is available in a wide range of colours & commercially viable designs, all whilst being able to withstand extreme wear & high traffic - perfect for very busy locations in leisure, education, office & retail environments. Flotex flocked flooring products are available in sheet, tile and plank formats. 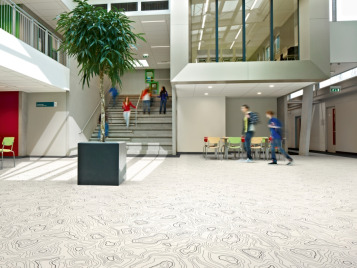 Forbo carpet tiles are renowned for their aesthetic styling and outstanding performance in the most demanding heavy traffic environments. 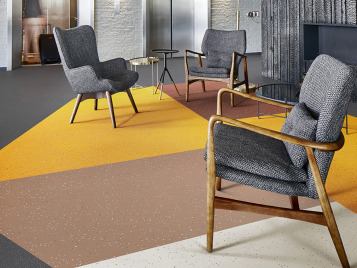 Side by side these three long established reputable brands offer specifiers and their clients an unrivalled carpet tile offer to meet every possible design brief. Entrance flooring is fundamental to modern building design: An effective entrance system can stop up to 95% of dirt and moisture being walked into a building, minimising maintenance costs, protecting the interior flooring and preventing slips. Achieving lower noise pollution is essential to reducing stress and promoting the well-being, comfort and efficiency of people working or learning. That’s why acoustic floors are key when it comes to reducing noise in buildings. Responsible for many accidents that lead to injury, slips and trips, floors have a lot to answer for. By choosing a Forbo safety floor the number of accidents caused by slipping can be reduced significantly. 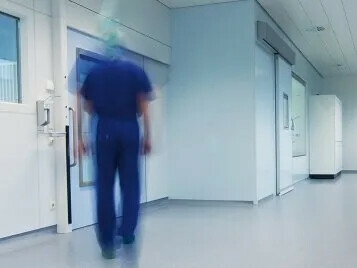 Our Step safety vinyl floor coverings have guaranteed life time slip resistant performance and offer safety solutions for a wide range of applications. Varying from R10 slip resistance (Surestep & Solidstep) to R11 & R12 (Safestep) for areas where higher slip risk is identified, like professional kitchens and flower shops. Linoleum can be used for much more than just creating beautiful floors! Our Furniture Linoleum and Bulletin Board collections are linoleum surfaces which have a multitude of application possibilities. Our For My Home collection offers you some of the most exciting and advanced floors all specifcially chosen to enhance any room in the house. 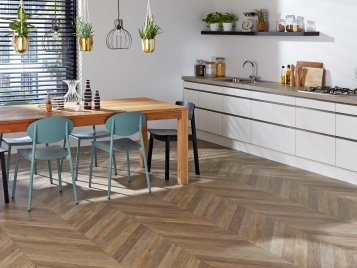 Designed to create a beautiful and comfortable interior with high quality floor designs, our For My Home collection includes natural, colourful Marmoleum tiles, strong and durable Novilon and Eternal sheet vinyls, warm and comfortable Flotex flocked flooring and our Allura luxury vinyl tiles. Explore the endless design possibilities. The floor is a crucial element of any interior design; creating the first impression and setting the tone. Our extensive range of colours, textures and products will provide you with endless creative possibilities.